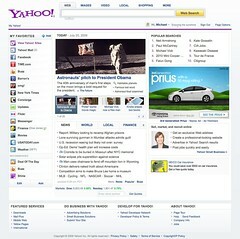 Yahoo’s new homepage is more like a feedreader and application platform for users to do more without leaving Yahoo.com. 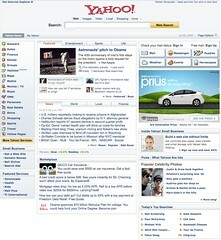 It’s a much needed update as Yahoo keeps up with the modern web, but think of it as evolution –not a revolution. Last week, a handful of Forrester analysts were briefed and given a demo of Yahoo’s much needed homepage redesign –here are my observations from the demo and conversation. The old version of Yahoo is in serious need of a refresher as the main page navigation hampers users with two sections of tabs with even more content and links. For the most part, the content not as personalized, and no integration of social. Perhaps the biggest missed opportunity is the page is designed for people to click through –using it as a pass through only. Fresh, streamlined design. The page architecture has less clutter, cleaner lines, less content, and is more focused. Personalization of media content: Serving a large broad audience is different for any site, so Yahoo has included a slider that lets users choose if they want “fun” or “serious” content in their news feed. This should also cascade to other elements such as application. Application Platform: A platform that allows users to integrate applications into the experiences such as default features like Yahoo mail, but also content that is bookmarked automatically becomes an applet that has high level content from RSS in the left nav. Rolling over these sections exposes the information in snippet formats –increasing a users ability to quickly scan over information. 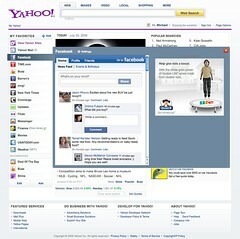 This also makes Yahoo.com more sticky, as users can get more done –without leaving the page. Real time content surfaced “Zeitgeist”: The “Popular Searches” on top right show a living breathing update of what people are looking for. This is simlar to Twitter’s trending topics –and a great way for the people to define editorial content –not just Yahoo’s content team. Mobile integration: Although I’ve not tried it, Yahoo has made promises to integrate this same experience with mobile devices, such as the iPhone. Yahoo follows modern web trends –but must evolve: Yahoo is following the trends in this space, where social updates from friends –and applications come front and center with this global redesign. 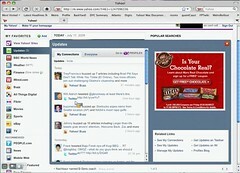 We see these trends in Microsoft Live, Facebook, and Twitter, among other portal type news sites. The design isn’t without flaws, the newsfeed should be front and center –not just news and media to really take advantage of what people care about. Brands should use this as opp –as users spend more time on site: As the Yahoo homepage becomes more sticky, and users spend more time interacting on this page, this means new opportunities for brand marketers that want deeper impressions with users –beyond advertising. Expect brands to create applications designed for interaction on the Yahoo apps left bar –then promote them from a variety of locations. Yahoo must reach to developer community: For Yahoo to be successful, they must foster their developer community, tie into existing application platforms like Facebook developer community or OpenSocial, and integrate more social features. Improvement for users –and Yahoo: For Yahoo this isn’t a revolution, but an evolution it’s long lineage of Yahoo homepages, much deserved, and a step in the right direction. This redesign should help users sort out the information waterfall –and find the information they need without opening too many tabs. Love to hear your feedback as a user, what do you notice and experience? Also, thanks to colleague David Card (Twitter, Blot Posts) who provided insight to this post. Note: I had a typo, and corrected it, and also removed a screenshot at the request of Yahoo as this feature may not be live for everyone as it’s under testing. Having too many stakeholders on your website results in forcing your users to trudge through a confusing experience, where each laborious step results in frustration then abandonment. 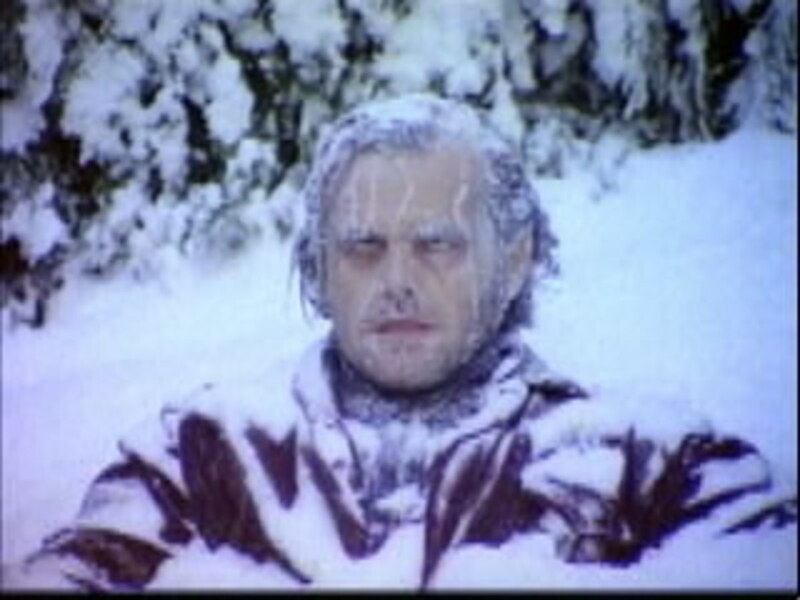 Like poor Jack N on the left, you have frozen your own users, your website is SNOWED. Being SNOWED is far worse than Avinash’s acronym of HiPPO (Highest Paid Person’s Opinion). At least with a HiPPO there will be at least some direction where the website is headed. What’s worse is having too many masters too serve, resulting in serving none. I created this little acronym which I encourage you to share with your stakeholders, hopefully your website won’t be SNOWED in either. Take for example the American Airlines website, which was so frustrating to users that designer Dustin Curtis decided to mock up an improvement and write this open letter. One of the designers from AA responded, saying there were over 200 stakeholders involved in the final output of the product, resulting in the jumbled mess of a corporate webpage. Reminds me of this self-created video from Microsoft showing what would happen if they designed the iPod package. Yes, we know that putting the needs of your users is key to a successful webpage, but it should also be coupled with the needs of the business. This is where the Web Strategist comes into play, who balances this with technology to deliver the right experience. This diagram of the three spheres of web strategy should come in handy, a great diagram to print out and put on the desk. New to reading me and want a hundred word summary? Sam Lawrence of Jive Software has compiled tag clouds of 10 bloggers he reads and has done a quick and dirty analysis of what we frequently talk about. What’s a tag cloud? It’s a collection of terms or keywords found in content or vernacular. It looks like he’s using IBM’s many eyes software to compile the cloud, which shows the heavier weighted or frequent terms in larger font. The cloud is comprised of words that aren’t necessarily in my wordpress categories, so it appears to be crawling and analyzing text. While tag clouds certainly are interesting, not everyone agrees they are helpful such as expert Thomas Vanderwal, Brian has the story. The job of a Marketer is to connect products with customers. While it’s often native for marketers to know their products, they often fail at truly understanding their customers. Today, customers are much more than just recipients of messages, they create their own messages, share with their peers, and in some cases, are working very hard to keep marketers out of the picture. In business school, I learned about understanding your customer, we learned about the concepts of Demographics (people’s lifestyles, habits, population movements, spending, age, social grade, employment). The goal was to create a model to understand who these people were, where they live, and what they do. We also learned that beyond understanding the who, we needed to understand the why, therefore understanding the psyhcographics (lifestyles and behaviors, what interests them, what they hold valuable and how they behave) became of importance. Sure, some of the really savvy marketers out there already know your audience, you’re involved in conversations with them all the time, or at one point you were a customer, but for many, that’s not enough. How about me? How well do I know my community on this blog? Judging by the analytics, I know I have a lot of readers in North American and then in UK. I can tell who some of the readers are by the comments that they leave, but that’s only a small amount. When I announced that I’ll add anyone who ads me back in Facebook, I ended up really getting to know my community, it really brought a depth that I didn’t have before. Some of you are saying, “that’s a lot of marketing mumbo jumbo”, but if you can’t define who your customers are, then how can you possible connect your products to people who you don’t know. Enterprise Intranets are an often overlooked corporate asset. These powerful tools represent the knowledge, relationships, and processes of a company, yet for the most part they go under-resources, under-appreciated, and given third-class citizenship to the public site and customer or partner extranet. We know they are important as they are a direct reflection of your corporate culture. If a company’s competitive strength is it’s employees and how they work together, the intranet is a valuable tool. Secondly, with many baby boomers in the United States retiring in the near future a great deal of corporate knowledge will be lost, how will you capture and distribute this tacit knowledge? There’s a few major reasons why the intranet is not fully utliized, it really comes down to corporate prioritizies and resources. 1) Leadership not employee focused. Web strategy is often owned by the Marketing department, or a dedicated web team, they have specific business goals to hit, and they are often aimed at marketing or customer focused –not employee focused. 2) Little love from IT: IT often owns the infrastructure, systems, and applications that the Intranet sits on top of, and they often are focused on ERP project and leave the intranet in a ‘maintaince and manage’ mode. 4) Too many cooks in kitchen: Many constituents from Marketing, HR, IT, and every business unit make decisions at an enterprise level difficult, unwieldy, and often not worth the effort. 5) Decision makers oblivious: Management and decision makers don’t use the intranet, they rely on administrative staff for scheduling, sometimes emails, and any intranet tasks, the pains and opportunities are rarely seen. Intranets have a variety of stages as it evolves, I’ve listed out the natural growth pattern that I’ve seen. 1) Disparate: The early stages of an intranets birth often lies in the hand of a forward thinking rogue that sets up a server beneath their desk and initiates the first behind-the-firewall website. Later, many others follow his lead and create their own intranets on modified workmachines, and then finally they are put on servers and supported by IT. These often horrific looking and abandonded websites have a disparte user experience, look and feel, and content. There is little or no consistency resulting in a fragmented experience for users. 2) Common User Experience: As the company realizes the importance of sharing information on a web repository that’s available globally and 24/7 (unlike email) the push to unify the disparate intranet into a common user experience occurs. Outsourcing to a design firm or to marketing will yield a look and feel, navigation and information architecture form. Likely, hopefully the birth of a dedicated intranet team occurs, who manage the ongoing program. They provide direction, strategy, processes, and styles for content and the experience. 3) Unified Content Management System: Unfortunately, just because the front end of the website and the processes are starting to solifidy this doesn’t mean the right tools are in place. For the intranet team to manage all the content updates, create versions, and obtain reporting becomes unrealistic. As a result, the need for the right tools are needed. In the past, these webpages may have been static created and managed by tools like Homesite, Dreamweaver, or raw HTML, the need for what you see is what you get software is a requirement. The Intranet team needs and wants to empower business owners to manage their own content within the framework of the enterprise intranet. Typically IT is resourced to obtain the CMS tool, which will likely glue into existing architectures and systems, sometimes without the consent of the experience of the user base. 4) Personalization and Enterprise Search: With the access for business groups to publish at will with their CMS system, massive content is created and documents of every flavor are uploaded. The intranet begins to progress to a great deal of information, but leaving a very unwieldy experience for users, as a result the push for ‘portal’ type of personalized homepages may emerge, where content is delivered based on team, location, and rank. More difficult than easy, this undertaking is often not completed to the full enterprise. Enterprise Search, a tool that looks at all internal documents and data repositories emerges and starts to scan, index, and serve up information for users. 5) Collaboration: Popular in the last few years, businesses started to realize that employees needed to work together on knowledge projects and the right tools to span distance and time were not available. A large influx of collaboration tools invaded the enterprise, allowing teams to share and work on documents together and in near-real time. While helpful to many, the promise of ongoing collaboration isn’t for every user, as the complexity of features can be mind-boggling. 6) Socialization: Fast forward to today, the enterprise intranet are starting to see social features, (some call this Enterprise 2.0, but I prefer to focus on outcomes) where employees can go beyond collaboration on ideas and start to tell others about themselves, connect with others, and share information. The social capital of a company (the contacts and influence within a company) starts to become realized and the need to share contacts, knowledge across the enterprise (regardless of location or team) starts to emerge. There are many challenges that come with this, as the data starts to move to application service providers if IT doesn’t respond and data, security, and personal information leave the firewall. IT departments that are too slow to keep up end up doing clean up as business units can easily deploy their own intranet using tools like blogtronix, ning, and a variety of others. 7) The future: It’s sure difficult to peer into the next 5 years, expect rich smart phones to start to access the intranet for secured users as collaboration and communication occure on the road, at home, and during weekends –the workplace (along with the intranet) goes with us. 1) A centralized body that controls the User Experience. A group that can define the design, look and feel, user interface, navigation, taxonomy, and information architecture of a site. They are also empowered to enforce this regardless of polical structure. 2) Business and personal users have freedom to publish: Although the constraints for consistency are setup, the business teams are empowered to control their own content, to quickly publish, and to modify at will. A balance is needed between them. 3) Expiration of content: The worst thing that happens to an intranet is the layer and layers of retired content that is overlayed on it. The intranet team should auto-review content that hasn’t been modified after X quarters or years, identify the creator, ask if it’s valid and remove if not. 4) IT gets ahead of the need: IT needs to move away from thinking of the intranet as a system to maintain, but as a system to grow, develop and constantly build on top of. Failure to do so will result in business teams finding their own third-party software, installing or running on a remote server. 5) A social sandbox for employees: Currently, many employees are sharing their personal and business lives on third party social networks like Facebook, MySpace, Bebo and to some degree LinkedIn. In many situations the opportunity for self-expression or to share personal information (even in the context of the workplace) is not supported by the enterprise. Companies should provide a social networking like service for employees to connect, share, build and further relationships on the intrarnet. Clearly delineate this is separate from the other area of the website, but give freedom for unique ideas to spread, grow, and be built. Facebook as a Corporate Portal Platform? My intranet background: I don’t talk about it as much now, as I’m more focused on social media, but it’s still a passion. But in the past I’ve managed a global enterprise one for Hitachi Data Systems, aligned one at World Savings (now Wachovia) and did UI design and management at Exodus and Cable and Wireless America. Details on my profile.